The differences between using a portable generator at home and using one on a jobsite are numerous and noticeable. 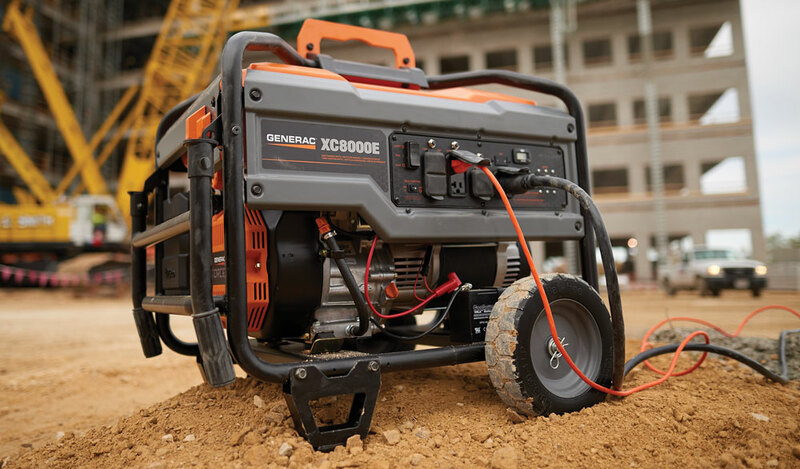 When used by a contractor or other professional, portable generators are workhorses. In new construction, they keep power tools operational until utility power is connected. Even then, because utility power might not be accessible from every part of the jobsite, the generator will be moved around as it is needed, working long days interrupted only by the need to refuel. By contrast, a portable generator used at home will spend a lot of its time idle. Unless you are an avid do-it-yourselfer with a large piece of property — the majority of which doesn’t have access to utility power — the generator will only come out during severe storms or other situations that lead to power outages. Thus, when choosing a portable generator for professional use, there are aspects of the unit you should consider more than others. These fall into three main categories: durability, reliability and ease of maintenance. At one time or another, we’ve all found ourselves driving down the road behind a contractor’s vehicle. Inevitably, too, we’ve seen a portable generator in the back of the truck, appropriately covered in dirt, dings and scratches. 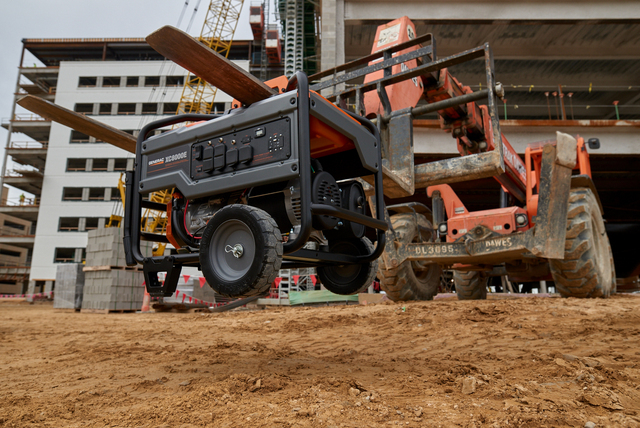 Jobsites are neither clean nor easy on equipment, and for that reason it’s important to invest in a portable generator that can take in stride everything a jobsite will dish out to it. What does that mean? For starters, look at the cradle. Many consumer-grade generators have a cradle designed less to protect the unit and more to hold the components in place. The cradle on professional-grade portable generators should also protect those components from damage. Does the cradle completely wrap the unit, including the fuel tank? It should, and it should also have extra protection around the engine and alternator — the kind that will keep other equipment from striking them directly. Next, consider the thickness of the steel used on the cradle. The unit of measurement for steel thickness is “gauge,” and smaller gauges mean thicker steel. Many consumer-grade portables use 16-gauge steel on their cradles. For professional use, look for units with perhaps 12-gauge steel, which can withstand more punishment. Speaking of steel, portable generators for jobsite use should be chock full of it. It’s more durable than plastic, and while it might add additional weight, it’s almost a must in terms of durability. One key component that should be made of steel is the fuel tank. On consumer-grade models, the fuel tank is often made of plastic. For professional use, look for a steel tank. There are a couple final considerations regarding durability. Do the outlets feature dust covers? It’s preferable if they do, given how dusty and dirty the jobsite can get. Are the wheels solid? Pneumatic wheels can provide more shock absorption when moving the generator, but they are prone to punctures and flats. Solid wheels are preferable on a jobsite. The engine your generator uses is key to determining how reliable the unit is. While its only job is to drive the alternator, that’s effectively job No. 1. For professional use, you want an engine that can endure running all day — every day — without fail. Many consumer-grade portables feature splash lubrication, similar to what is found on many lawn mowers. While that’s fine for units that will only be called on periodically, on a jobsite you want pressurized lubrication — like that in an automotive engine — to ensure that the engine stays cool and lubricated during those long hours of operation. It will also ensure the engine stays lubricated if the unit accidentally gets tipped over — a real possibility on a jobsite. Just look for an oil filter. If one exists, then the unit has pressurized lubrication. Because fuel is your engine’s lifeblood, a second factor in generator reliability is fuel tank capacity. Yes, generators can be refueled, but a portable generator should start and stop when you want it to, not in the middle of a workday because it ran out of gas. Make sure that the generator has enough onboard fuel capacity to run for at least eight hours. Many generator manufacturers will provide running times at half load — half as much power as the unit can provide. This is actually a perfectly acceptable rule of thumb. Rarely will you consistently use the generator’s full capacity. Tools get turned on and off, used and put away throughout the day. Choosing a unit that can run for at least eight hours at half load on a full tank of fuel will ensure you have a unit that will operate on your schedule and can be fueled either at the beginning or end of the workday. One feature many professional-grade portables offer that helps to conserve fuel and extend running times is idle control. When turned on, idle control reduces engine speed when the generator is not called upon to deliver electricity. For example, a drill might be plugged into the generator, but until the trigger is pulled, the drill requires no electricity. Until then, the engine will slow down to conserve fuel — and extend overall running time. Finally, it’s important to always be able to reliably start your engine. Many professional-grade portable generators make this possible via electric start, which is done with the touch of a button. But what if the battery used to start the generator should fail? In that case, it’s important that your generator have traditional recoil start as a backup to electric start. If the electric start doesn’t work for some reason, you should still be able to start the generator the good old fashioned way. Just as refueling in the middle of a workday can be inconvenient on a jobsite, having to deal with breakdowns can be catastrophic. A broken generator means downtime. The best way to avoid equipment failures is to ensure that you invest in a generator that is easy to maintain. The first objective is keeping the engine in good health, and that means maintaining the oil. Not only should your generator make it easy to check and top off the oil at the beginning of every shift, but it should be easy to change as well. As with most professional construction equipment, oil should be changed based upon hours of operation. For that reason, make sure your portable generator has an hour meter, preferably one that can be reset. Then you can schedule oil changes based upon the manufacturer’s recommendations and reset the hour meter every time you change the oil. This makes it particularly easy to keep up with oil change intervals. Another routine maintenance item of importance is the air filter. Given how dirty jobsites are, the air filter should be easy to access and replace, so that your generator’s engine runs as efficiently as possible. Access to spark plugs is also important. Occasionally a spark plug will become fouled or otherwise inoperative, and unless it can be changed quickly, you’re looking at more downtime. Some generators make it particularly challenging to access the spark plugs, sometimes even requiring that you remove the fuel tank to get to them. Before choosing a portable generator, make sure the spark plugs are easy to access when you need to. One final consideration for portable generators used professionally that doesn’t fall under the previous categories is OSHA compliance. That means having a control panel that is GFCI-protected. Look for a model with full-panel GFCI protection for use on jobsites. Jeff Magedanz is a marketing manager with Generac.